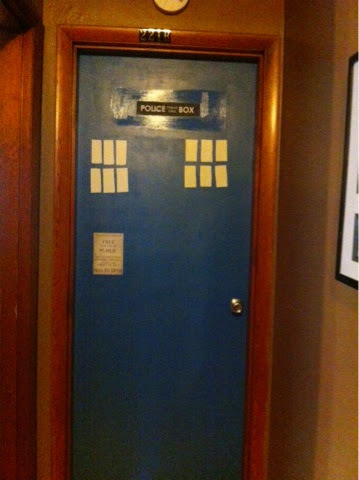 I painted Abbey's door because I thought it would be fun and cool. Her response when she saw the pics was "its out of proportion but okay." oh and in case you didn't notice it. It says 221B which is Sherlock's apartment number. Her thought on that was its crooked. I took my Christmas tree down on Christmas Eve, We had already opened our gifts so I didn't see any reason to leave it up. It had become a play structure for the cats. Sadly the lights (its a pre-lit) got tangled between two of the pieces. I was tempted to cut them loose, but then the thought of stringing lights was enough to make me shove the tree in a box still stuck together and hope it untangles by next Christmas. I painted my kitchen I LOVE the color but I was so tired after spending two days taking ugly border down (I had to buy a steamer to actually steam it off the wall) that the paint job is kinda lazy. Meaning I got spots on the ceiling and on the trim. So now painting the trim and ceiling have to be added to the to-do list. I'll show you pictures of my kitchen once I get everything put back into place. I listened to a podcast while I worked. If you like true crime, and podcasts. I suggest Serial Podcast. Its awesome!!! I have been drying to talk to someone about it, but no one I know has ever heard it. So please someone listen to it and then talk to be about it. My dryer died. I am pretty sure its the belt, but I have no idea who to call to fix it. It came with the house, so I'm guessing it isn't under warranty. I keep telling myself that I'm going to fix it myself. 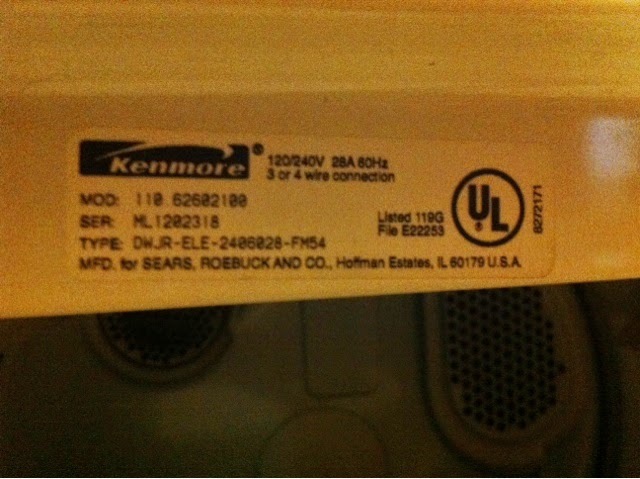 I even went so far as to take a pic of the model number of my dryer. Somehow though my phone uploaded that pic to Instagram. Not only did it do it once, it did it twice. So my phone must think its REALLY instagram worthy that you know what make and model my dryer is. In case you aren't in my Instagram and keep missing my dryer details here it is. Oh, I've heard of Serial. I haven't heard it, but I've heard OF it. That counts, right? Also, that's a great Instagram picture. Give me "dryer serial number panel" over "selfie duck face" and "crappy dinner I cooked" any day! I'm sorry about your dryer. Thanks. I had hoped she would be more excited about it. I finally got the top off the dryer. It is definitely the belt. Now to find someone who can replace it. no selfie duck face for me, and since I can't cook, no one wants to see that. At least you have heard of Serial. Which is better than most people. No one else seems to know what I am talking about.